The Inspector 3000 meets the American National Standard Institute's "Guideline for Barcode Quality' (ANSI X3.182) method for verification. TP140A Verifier Cable. Replacement TP140 and TP140A printer cable. VCIR Inspector Series PC Interface Software Kit USB. 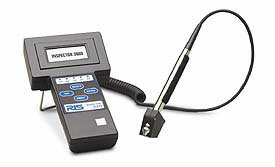 For customers requiring printed inspection reports, printed scan reflectance profile charts, Excel spreadsheet job reports REQUIRES access to a PC computer with USB port. Stand, Tilt Handheld. Bent metal stand that attaches to the D4000/I-4000/L-1000 verifier body (display). Test Symbol (Multiple Barcodes) Sheet. Test sheet is only for checking that D4000, I-4000 or L-1000 can scan each type of barcode symbology. Does NOT test accuracy of the barcode verifier. Battery Charger, 110V. Compatible with D4000, I-4000, or L-1000 barcode verifiers. Can be used with or without NiCad batteries. The RJS 002-5626 is also known as RJS-3000	or 0025626	.